If you like fancy velvet blazers and jackets and need some with floral patterns and more, Manzini has your back. 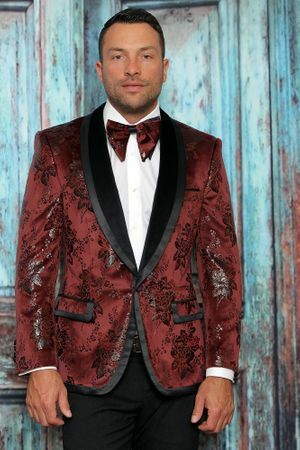 Manzini specializes in their designer style tuxedo jackets and blazers for the man who loves what style is all about. This burgundy paisley pattern blazer features a modern fit which is a bit more tighter fitting than a regular fit with double vents and the bow tie.